At seventy-nine, Vance Havner continues to stir revival fires among God’s people from coast to coast. From his home in Greensboro, North Carolina, he takes the time to laugh, reflect on his ministry, and encourage his fellow preachers. The interviewer is Dennis J. Hester, pastor of Jonesboro Baptist Church, Roseland, Virginia. Hester: How has preaching changed during your life? Havner: Circumstances change, but preaching never changes. We preach a message so much greater than ourselves. We must give it our best as we stand behind the pulpit. I hear so much today about tension. If the preacher is going to give preaching his best, he needs to be tense. I don’t mean nervous but keyed up with God’s power and message. There’s not anything that can rejuvenate me like preaching. Preaching should be full of life. It is life. R. G. Lee used to say, “There’s not anything that’s wrong with me that a good sermon won’t cure”. Hester: How do you prepare yourself and your sermons to preach? Havner: I don’t have a set pattern. I like to do a lot of walking and thinking. Walking is a thing of the past. Preachers are involved in too many meetings and. programs. Meditation and solitude are lacking in many of our preachers. Not so much praying, but just thinking about the things of God. I have a place down the road where I do a lot of walking and thinking. Occasionally, I get distracted by someone on a bicycle or one of these joggers. I like to tell the story about the man who had a heart attack jogging from a health food store. You can’t do much thinking while jogging and gasping for breath. Hester: What do you see as the future of preaching? Havner: There’ll always be preaching. Preaching has been my priority for years. When I first began serving a church, I thought it was my duty to be of service to every club, social gathering, or committee that demanded my time and energy. In my early days during revival meetings, I would overly commit myself during the day, speaking and visiting. Then, that night when the main service came, I was already worn out. I think visiting and preparation for a revival is the pastor’s job, not the evangelist’s. Now I limit my preaching to one service per day. I don’t overeat or over socialize after the meeting. Charles Finney spoke of these two evils, overeating and over- socializing. Hester: What techniques of evangelism have proved successful for you? Havner: I don’t have any special techniques. I never have. I don’t maneuver any preaching engagements. I’ve never done any advertising, printed brochures, or publicity. I am not an evangelist or a pastor, just a preacher. I’ve been trying for a long time. There never was a time when I felt I shouldn’t be preaching. I began preaching in 1913 at the age of twelve. I have more to do at the age of seventy-nine than I’ve ever had. I tell church folk that when I get a little older, I am going to have to cut down on the program. I do a lot of Bible conferences. Preachers ask me how to get started in this type of work. I can’t tell them how. It just happens. God calls you, and then he’ll open the doors for you to preach. He’ll make a way if he’s called you. You just be there. Hester: What do you think are the major strengths and weaknesses among the Southern Baptist preachers today? Havner: I think Southern Baptists have some good, strong preachers today. I’ve been on the platform with many of them. They are doing a great work, especially some of the younger ones. Hester: You’ve met a lot of the spiritual giants of yesterday, haven’t you? Havner: Yes, I’ve been fortunate enough to hear some of the best teachers and preachers of this age and the past-such men as Billy Sunday, W. B. Riley, H. A. Ironside, J. Wilbur Chapman, Mel Trotter, Homer Rodeheaver, Gipsy Smith, George W. Truett, Baxter McLendon known as “Cyclone Mack,” James M. Gray, Gresham Machen, Donald Grey Barnhouse, Charles M. Alexander, William Jennings Bryan, and R. A. Torrey. Hester: How would you suggest a person prepare for the preaching ministry? Havner: First of all, there must be a genuine call from God. If you don’t have that, you might as well forget it. We have too many folks that preach for publicity and money. I can’t say one doesn’t need an education. The trouble with many schools today is you don’t get enough Bible. The Bible must be a first in a preacher’s life. We need more prophets today, not just the predicting type, but the “Thus saith the Lord” type. We need preachers that will take to the woods and spend time with God and his Word. Hester: As you travel from coast to coast preaching, how much of an interest is there in revival? Havner: There’s not much interest in the spiritual life. I don’t think America is ready for a revival, nor does she really want a revival. Like the Laodicean church in Revelation, she’s neither cold nor hot. I see revival taking place in a few churches on a small scale. Of course, revival could take place in a massive way. We must remember, revival is always possible when people humble themselves, pray, seek God’s face, and turn from their wicked ways. But too many churches are settled and satisfied. Hester: How did your writing ministry begin? Havner: Once again, there’s no Set pattern on how to get started. There’s got to be fire in your bones. With God’s help, it’ll happen. I started writing devotions and drawing in the first grade. Later, I began writing an inspirational column called “Havner’s Reflections.” Little did I know as I wrote for the Charlotte Observer, the leading newspaper in North Carolina that God was preparing me for a writing ministry. My first book, By the Still Waters, was published in 1934 and is still selling today. I’ve written articles for numerous publications and thirty-one books consisting of sermons, devotions, and collections of a variety of memorable experiences. One in that list was sort of an autobiography entitled, Three Score and Ten. Douglas White did a biography of me a few years ago entitled, “Vance Havner, Journey from Jugtown” and Baker Book Company has recently reprinted in paperback, The Best of Vance Havner. I remember one book I wrote called Blood, Bread and Fire. The publishers felt it needed a new title. I never did like the new title because it read more like an epitaph than a book title. There it was in bold print, Entered into Rest-Vance Havner. I get letters from all over the country telling me how my books have been a great comfort to troubled souls. That’s worth the writing. All I’ve ever wanted to do was be a traveling preacher and write. God has given me the desires of my heart. Hester: Out of the thirty-one books you’ve written, which one means the most to you and why? 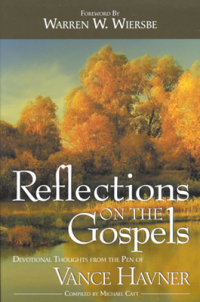 Havner: Though I Walk Through the Valley is special because I wrote the book in 1973 after the death of my wife, Sarah. Sarah was a wonderful wife. So many youngsters are marrying today without love, romance, or any devotion for one another. I wasn’t married until I was thirty-nine, but I am sure I got the woman God wanted me to have. Sarah was worth waiting for. Hester: Do you have something you would like to say to your fellow ministers who will be reading this interview? Thanks for doing this…..I still miss him. Just getting acquainted with Vance. Found one of his books on the give away shelf at church “Jesus Only”, and became inspired by his words. Found and visited his grave a few weeks ago. God is speaking to me through Vance’s words.